We live near an all-girls high school and on "mufty day" I cringe as a sea of teeny weeny denim cut-off shorts stream across the crosswalk from the train. Tweens and teenagers want to be cool, of course, but there are not many authentic options for their size. I get excited when I find stylish labels for kids that target that tricky 8-14 years bracket. 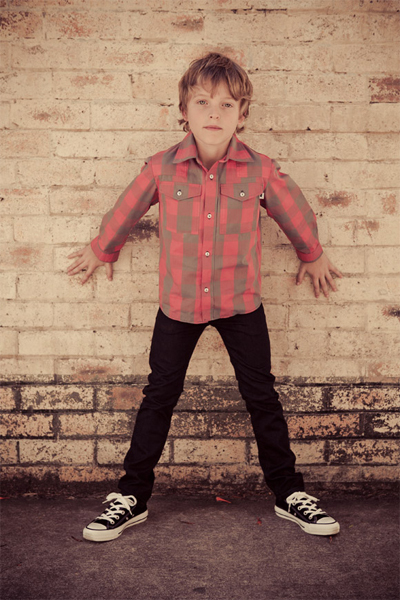 Australian kids fashion label Little Mouse Brown has done an incredible job of pulling together a chic collection for boys and girls that mixes and matches well with the teen staples (jeans, converse sneakers), and keeps it cool (with nary a short short to be seen). There are so many items in this collection that I would love for myself. That bat-wing t-shirt dress with cord belt is killer, the carefully placed ruffles, and that great modern check pattern. Love it all. You can find Little Mouse Brown in the online store and at stockists around Australia and the USA.